PREVIEWING THIS FALL! The largest urban community development is now well underway with almost all suites SOLD OUT in Phase 1 Park Avenue Surrey City Centre! The 2nd Phase is coming soon with new floor plans, finishes and availability! The preconstruction Surrey Park Avenue West condo tower is located at 100 Avenue & Whalley Boulevard Surrey BC. 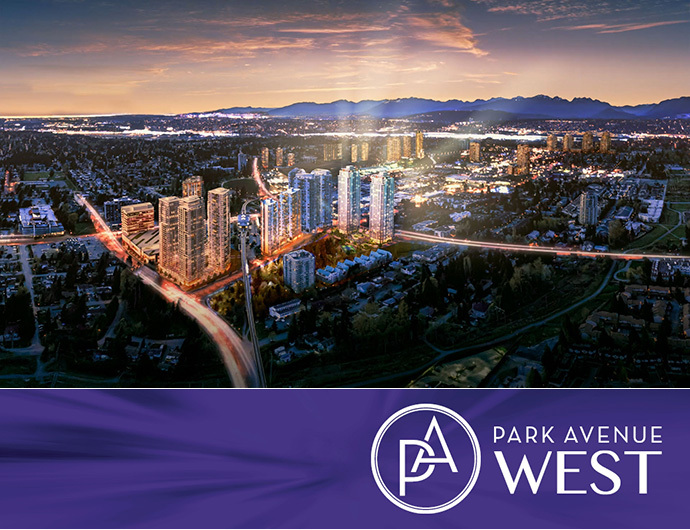 Park Avenue West completes this master oasis, right in the heart of Surrey City Centre, the fastest growing city in BC. 5 minutes walk to Skytrain, mall, parks, library and numerous amenities, the new Surrey Park Avenue West condos boast resort luxuries including an outdoor lap pool with cabanas, sky garden, tennis court, marble tile finishes, large balconies and many more. Coming Fall 2014. REGISTER NOW at www.ParkAvenueLiving.ca. The landmark tower is brought to you by Concord Pacific developers. The site is located within walking distance to local bus transit routes, the SkyTrain Line, Park Place Plaza, Canada Revenue Agency building offices, Holland Park, Central City Mall, SFU Campus, Surrey Civic Plaza, the Surrey Memorial Hospital, Outpatient Facility and the RCMP Headquarters. 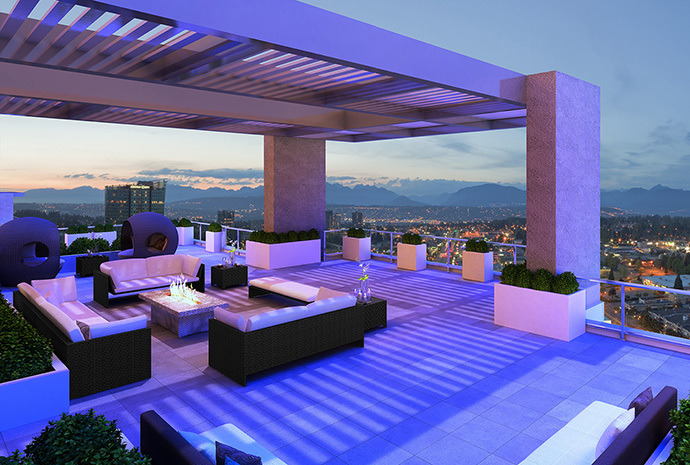 Some of the awesome amenities at the Surrey Park Avenue West condo tower includes an outdoor pool complete with expansive pool deck, chairs and cabanas in addition to a grand entrance lobby and a Sky Garden with fire pits and comfortable seating arrangements. There will also be a tennis court, golf simulator and a spa retreat. There are 4 different housing types to choose from that include the new Surrey Park Avenue West Townhomes, the lower residences, Lower Sky Collection and the premium Upper Sky Selection penthouses and sub-penthouse residences at PA West. The PA West townhome floor plans are 3 bedroom with interior living space around 1,343 square feet with terrace/balcony space of approximately 723 square feet. 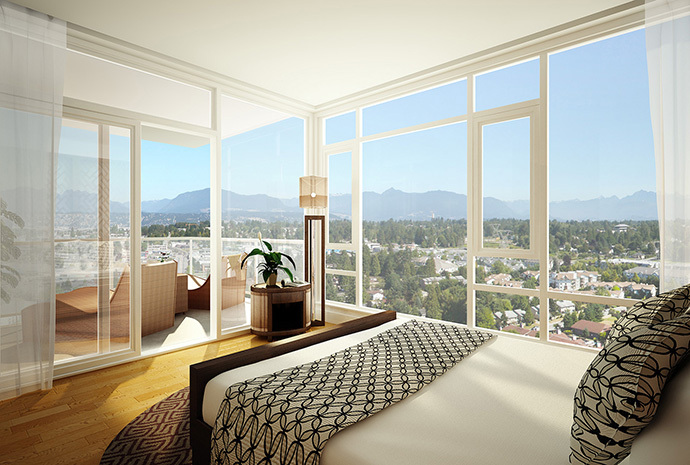 The Park Avenue West lower residences in Surrey City Centre include 1 bedroom, 1 bed+den and 2 bedroom floorplans. There are 11 homes per floor. The Lower Sky Collection at Park Avenue West tower will feature only 9 homes per level with a selection of 1, 2 and 3 bedroom layouts. The most luxurious homes are the Upper Sky Collection Surrey Park Avenue West penthouses and sub-penthouses which offer 7 homes per floor with a fine selection of 2 and 3 bedroom floorplans. The PA West condos will feature high-end interior finishes that include a choice between 4 different colour schemes that include: Hamptons, Manhattan, Reflection and Impression. In addition, all suites at the new Surrey PA West condo tower will feature spacious open balconies or terraces, extending your indoor living space outwards. The windows will have premium Venetian blinds and there will be TV and telephone jacks in every principal room. All homes will also feature a stacked front loading washer (Energy Star qualified) and dryer in-suite. The new Surrey Park Avenue West condos will also feature premium carpets in the bedrooms and closet organizers for any closets that are wider than forty eight inches. For anything narrower, there will be a rod and shelf. 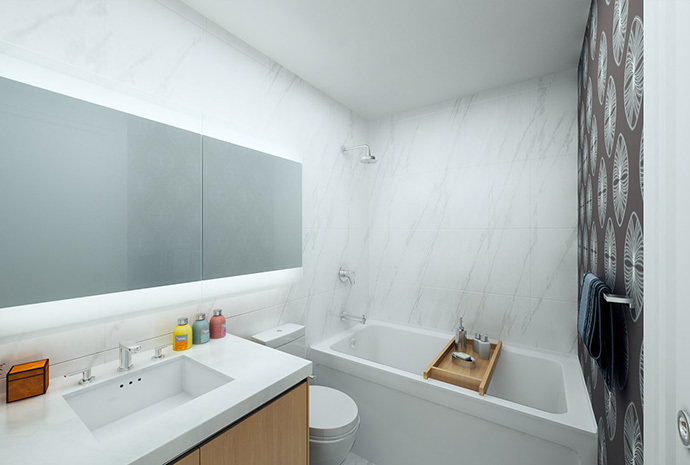 The beautiful bathrooms at the Park Avenue West Surrey condos for sale includes engineered quartz stone counters, large format marble tiled floor and marble tiled shower and tub surrounds. As well, the ensuite or first bathroom will have laminate vanity featuring soft close hardware and a custom medicine cabinet with built in lighting, shelving and a mirror. Other bathroom finishes at the preconstruction Surrey PA West condos include a dual flush toilet with a soft close seat in addition to a polished chrome Kohler faucet, shower head and tub spout. The second bathrooms will feature a walk in full length shower stall partially enclosed with frameless glass in addition to mosaic marble tiles on the shower floor and the surround. All the other finishes are equivalent to the master ensuite. The presale Surrey PA West condos will also feature gourmet kitchens that come with laminate cabinetry with open glass display shelves and under cabinetry lighting. Like the bathrooms, the new Surrey Park Avenue West condominiums will have cabinetry with soft close hardware, waste recycling bin and sliding basket under the sink in addition to a magic corner. The quartz stone counters are fabulous as are the large format marble tiled backsplashes. The large single bowl stainless steel under mount sink in combination with the modern polished chrome faucet by Kohler give your kitchen a great modern look and feel. All homes at the pre-construction Surrey Park Avenue West tower will feature an integrated appliance set that includes a microwave installed with trim kit, wall oven, gas cook top and dishwasher with integrated panel. As well, the new PA West Surrey City Centre condos will have a hood fan and a bottom mount counter-depth fridge with integrated paneling too. 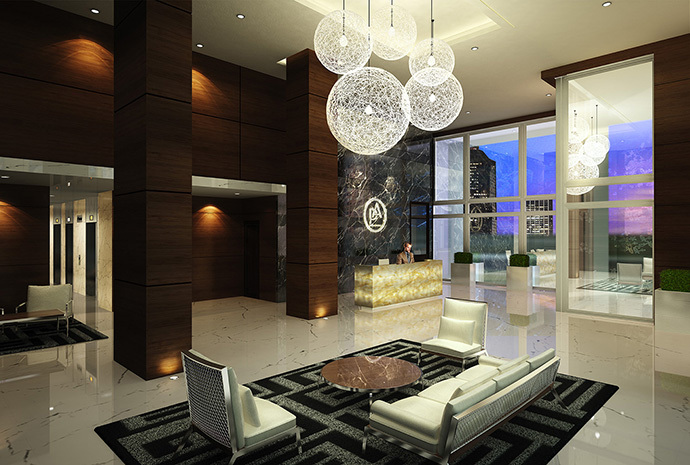 Park Avenue West Condos Now Previewing! With phase one is almost sold out! The largest urban community planned in the Lower Mainland. 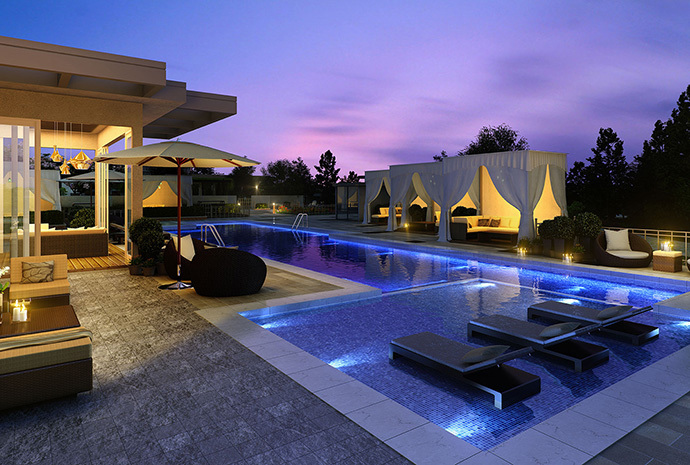 Resort lifestyle is included! 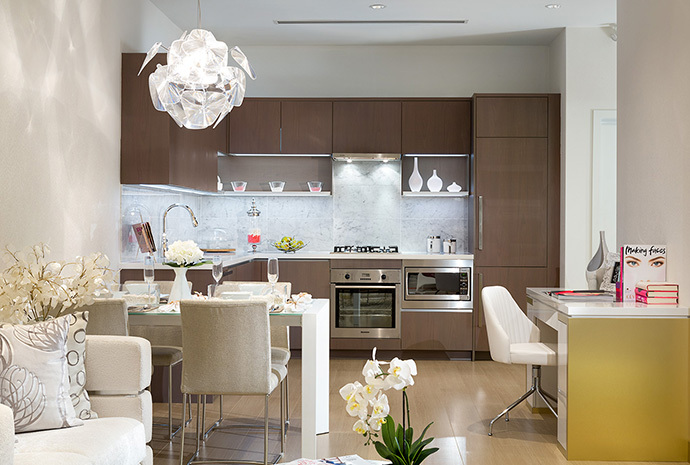 This is Park Avenue Surrey West Tower condominium residences! Timeless elegance and high energy define PA West Surrey high-rise tower, Concord Pacific’s hottest new high-rise development. Located in the heart of Surrey City Centre, it is the strongest growing metropolis in Canada. Phase One was an immense success. Now, the developer is excited to announce Phase Two at Surrey Park Avenue condos, or PA West, which is coming soon. The presale Surrey PA West condos feature large sized balcony, high-end finishes and underground parking. Topped with Club PA at Surrey PA West condos, a full collection of the best resort style amenities never seen before in the city, this is truly a smart real estate investment and a very rare find. The Surrey sales centre for PA West condos is located at 9908 King George Boulevard Surrey (next to the King George SkyTrain Station). They are open daily at 12-6pm.